Jodhpur is a significant city in the largest Indian state of Rajasthan. It is the second largest city and one of the most important tourist destinations in the state. It plays an important role in the boost of Rajasthan tourism and India tourism as well. It was the erstwhile seat of a princely state of the same name, Jodhpur. Marwar was the capital of the erstwhile princely state of Jodhpur. Today, the city of Jodhpur is a great tourist destination featuring many majestic forts, pompous palaces, beautiful gardens, and spectacular temples within the city and around. 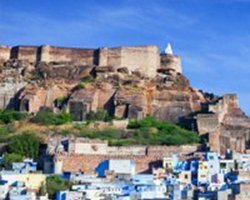 There are numerous attractions and places of interest in and around the city which will amaze you on your Jodhpur sightseeing tour in Rajasthan, India. The city of Jodhpur is famously known as the “Sun City” because it enjoys the bright and sunny weather throughout the year. It is also known as the “Blue City” because there are many houses and buildings in old city area, painted and decorated in blue and shades of blue color. The old city of Jodhpur circles the majestic fort, namely Mehrangarh Fort, and is bounded by a wall with many massive gates. Over the past decades, the city of Jodhpur has been expanded significantly outside the wall. Strategically located in geographic center of the Rajasthan state, Jodhpur city has been a convenient base for travel and tourism in the region, attracting tourists from all around the world. The city of Jodhpur was founded in 1459 by Rao Jodha Ji, a Rajput chief of Rathore clan. Most notable attractions and places of interest in the city are Mehrangarh Fort, Rao Jodha Desert Rock Park, Chamunda Mata Temple, Jaswant Thada Cenotaph, Ghanta Ghar (Clock Tower), Ummed Garden, Udai Mandir, and Umaid Bhawan Palace (consisting a hotel and a museum. There are also several other attractions around the city you can make excursion to. Some prominent attractions within proximity include Auwa Fort (converted into a hotel), Auwa Lord Shiva Temple, Mandore Gardens & Monuments, Kaylana Lake & Garden, Balsamand Lake & Palace, Sardar Samand Lake & Palace, Mandaleshwar Mahadev Temple (Mandalnath), Masooria Hills & Garden, Machiya Safari Park, Bhim Bhirak Cave, Ratanada Ganesh Temple, Veer Durgadas Smarak (monument, park and museum), and Ravan Ka Mandir, the only Ravan temple in India. Apart from attractions and places of interest in and around, the city of Jodhpur will also fascinate you with its unique culture & tradition. The cuisines originated in Jodhpur are very popular. Some of the popular dishes and cuisines are Mawa Ki Kachori, Pyaaj Ki Kachori, Dal Bati Churma, Atte Ka Halwa, Kadhi Pakoda, Makhaniya Lassi, Hot & Spicy Mirchi Bada, Lahsan Ki Chutney, Gatte Ki Sabzi, Mirchi Ka Kutta, Malpua, Ghevar, and Besan Barfi. The city of Jodhpur is also renowned for handicrafts. It is worldwide famous as a hub of artistic furniture and handicrafts. In fact, handicrafts industry is the largest industry of Jodhpur surpassing the tourism industry. Mojris or juttis (shoes) are very popular. If you want to explore some of the finest forts, palaces, places of interest, and handicrafts of Rajasthan then you must embark on Jodhpur sightseeing tour. Exploring attractions in and around the city of Jodhpur will give you a pleasant and wonderful tourism experience to relish for lifetime. The city also features excellent accommodation facilities as there are number of luxury hotels and heritage hotels including budget hotels in and around the city. The city is well connected by air, rail and road. The city of Jodhpur can be accessed conveniently as it has well-established rail, road, and air connectivity to major cities of the country. By Air: Jodhpur has its own airport. The Jodhpur Airport is one of the prominent airports of Rajasthan. Daily flights from Delhi, Mumbai, Jaipur, Udaipur, and Bangalore are available connecting to Jodhpur. By Road: Jodhpur city has well-connectivity by roads with all major cities in Rajasthan and neighboring states Delhi, Noida, Gurgaon, Surat, Ahmedabad, Agra, Ujjain, etc. Daily bus services are available from Jodhpur to Delhi, Ahmedabad, Jaipur, Udaipur, and Jaisalmer, and vice versa. By Rail: Jodhpur city is well-connected with all the major Indian cities like Delhi, Alwar, Mumbai, Kolkata, Bangalore, Chennai, Trivandrum, Chennai, Kota, Pune, Kanpur, Bareilly, Ahmedabad, Hyderabad, Patna, Guwahati, Nagpur, Lucknow, Jaipur, Gwalior, Bhopal, Indore, Dhanbad, etc.